An NSF-funded project at Brookdale Community College is helping faculty create interactive digital textbooks. Whenever students at Brookdale Community College have free time, they typically engage with their mobile devices, according to Mike Qaissaunee, chair of the Engineering and Technology department at the Lincroft, NJ, institution. That observation led him to wonder if he could create academic content and deliver it directly to students' mobile devices. Not the static content they're used to, but interactive content that would lure them into using their devices for academics. "Any free time they had, like waiting in line for a bus or in the cafeteria waiting in line to get some food — we could capture those moments and engage them with content," said Qaissaunee. Qaissaunee wrote a grant and a year later the National Science Foundation funded his E-MATE project, which aimed to provide professors with a blueprint to create interactive e-books. "We give them resources and training materials to learn how to use certain tools to develop their interactive content," said Qaissaunee. "[We wanted to] learn how to build interactive content and learn best practices in doing this." The E-MATE team partnered with the National Center for Optics and Photonics Education (OP-TEC) and the National Center for Supply Chain Technology Education, both of which supplied content suited to Brookdale's Engineering and Technology courses. The team turned that content into three e-books: Fundamentals of Light and Lasers, Introduction to the Automated Warehouse and Essential Mathematics for Engineering Technicians. During the process, Qaissaunee and his team identified and documented best practices for creating e-books, which they're eager to share with professors at Brookdale and beyond. The E-MATE Web site offers additional resources for planning and building interactive e-books: e-mate-bcc.org/getting-started. E-MATE (E-books and Mobile Apps for Technician Education) is an approach in which professors adopt various tools to create customized e-books specific to their courses. "We tried to identify [tools] that [professors] already have or that they can get fairly easily — and those that have fairly flat learning curves," said Kelly Parr, E-MATE team member. One of those tools is iBooks Author, a free download from Apple. This app allows anyone to create textbooks, using a variety of templates to organize content. "It's such a great [tool], why reinvent the wheel?" asked Parr. Once complete, e-books are available for download by students using Apple devices. 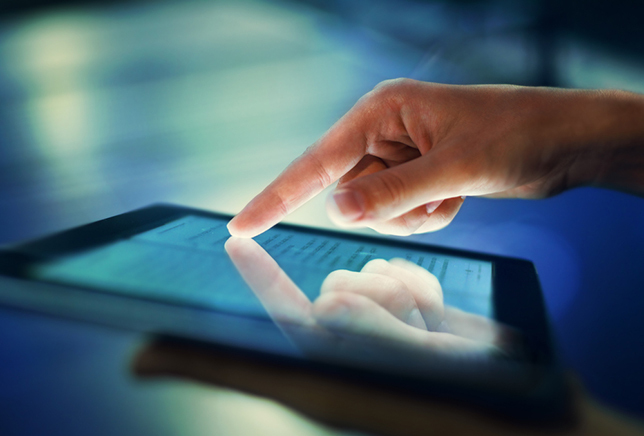 Professors can make their e-books more engaging by using widgets to embed interactive content. For example, students can view videos and animations or play games to gain additional knowledge. In Brookdale's Fundamentals of Light and Lasers e-book, a passage on light refraction includes a brief animation to help students gain an understanding of the concept. In addition, the end of each chapter features videos on lab experiments. Not all students use Apple devices. To accommodate those who don't, the E-MATE team teaches professors to create e-books that are available on all platforms. Professors can still create their e-books using iBooks Author, but then export them as interactive PDFs and use third-party software, like BookWidgets or Tumult Hype, to embed their animations and videos. To make their e-books available to an even wider audience, professors can turn them into stand-alone PDFs. This version of the e-book comprises a folder that contains the PDF file and its digital assists, like interactivity. Students without an Internet connection can view and consume these files. The E-MATE team is also working to create a fully Web-based version of their e-books. "So somebody with just a Web browser can view the interactive e-book," said Qaissaunee. Professors who have access to an Apple computer with the Yosemite operating system (OS X 10.10) or later incur no up-front cost to create an e-book, said Parr. Those who use the third-party software to embed interactive content so non-Apple users can download their e-books will have a minor expense. Students will realize some savings when professors start producing e-books on a wider scale. OP-TEC's Fundamentals of Light and Lasers, for example, costs $75 in hardcover and is $59.99 as an e-book. Essential Mathematics for Engineering Technicians is only available as an e-book and costs just $29.99, and Introduction to the Automated Warehouse is free as an e-book. "Textbook prices have gone way up. The Bureau of Labor Statistics did a study [indicating] that they have gone up 82 percent in the last decade. Most of the major publishers are looking at e-textbook options," said Gordon Snyder, associate director of OP-TEC. Snyder asserted that e-books are just "better" than hardcover books: Their interactive elements allow students to focus on what's needed, providing content for the muddiest points and for those concepts with which students struggle the most. Peggie Weeks, E-MATE's external evaluator, gathered 40 students to gauge their reaction to the e-books the team created. She asked them to rate their engagement level and if the interactive features helped them. "Overwhelmingly, almost 90 percent agreed or strongly agreed that the interactive features helped them to learn the subject matter," said Weeks. "Those features also added value for them in the learning process. [The math videos] really helped them have an understanding of the math concepts." Weeks also conducted focus groups, interviewing students face-to-face. One student who was struggling with constructive interference, a difficult concept to grasp in optics, told her he didn't understand the text when he read it initially. Then he viewed the interactive widget and the concept was clear. Using multiple senses benefits students, said Weeks. Over the past three years Qaissaunee and Parr have identified the best practices associated with creating e-books and are starting to share their expertise. Their first piece of advice: Start small. "Focus on a lesson in your course or a unit in your course, a week or two or three," said Qaissaunee. He advises professors to use existing content and to build on that. But before they begin, professors need to plan ahead. "Map out what you want to do. What's the story you are trying to tell?" said Parr. She noted that iBooks Author has several templates that make it easy to shuffle chapters around. However, it's difficult to move single pages. "We want people to organize their content knowing what is and isn't easy to move around," she said. She encourages professors to map out their content in an Excel spreadsheet before they begin. Professors also need to be prudent about using the bells and whistles in iBooks Author, like animations and videos. Parr tells professors to identify those technical concepts students have difficulty grasping, and create interactive content to reinforce them. "That's where we start developing these interactive elements. We're trying to target students with different learning preferences. [Don't just] develop interactivity because you can or because it's cool. [Use it only when] it make sense for learning," said Parr. Qaissaunee hopes to secure future grants to create an online course and develop a two-and-a-half day workshop that he a Parr can take on the road. "Professors can bring their content to the workshop and we will work with them. They'll leave the workshop with interactive content that they can share with their students," said Qaissaunee.